I know that a lot of big box stores. I mean heck you can buy them almost anywhere nowadays even the grocery store has those. You like Deira flame type logs and things like that are those good are safe to burn in your fireplace. Everything's OK to burn in your fireplace except for wax candles as long as you get it inspected and if it necessarily clean every year. Do people call you when they're buying a house or moving into a different house because they want to see if the chimney is ... Maggiori informazioni is is workable and usable. Absolutely. For many realtors or be referred by many home inspectors to have a fireplace properly inspected due to their moving in or moving out. We're doing we're doing the functionality of a fireplace chimney. Chad why would somebody use an easy carry insta great rather than buying the big old you know old school grade that I remember my parents and my grandparents had in their fireplaces. Well the easy carry integrate as it informs in its name was developed for the chimney sweep so they could offer a great to the people of the public so they don't have to go to a big box store to buy a great it's ready for them to burn as soon as we leave. Nor are they something that needs to be replaced very often. Definitely a question about how much you burn and what you burn on it. So the more you burn the more the. Well I mean it's a piece of metal. No matter if you buy a big a big one little one it's all going to depending on how thick it is and how much you burn. I know that you talked in the past about being a certified chimney technician. What makes you different than you know Joe Schmo from down the street that goes ahead cleans chimneys. I'm not just a certified Sumii technician I'm a certified master technician. I've been certified for 14 years. Got my master's. And you've gone through all the steps to prove that you actually are proficient in what you're what you're inspecting fixing and repairing and you've proven that you know what you're doing by taking a path that is not required by the states to take. But it is absolutely a valuable task to take to prove that you know what you're doing in a fireplace in the street. 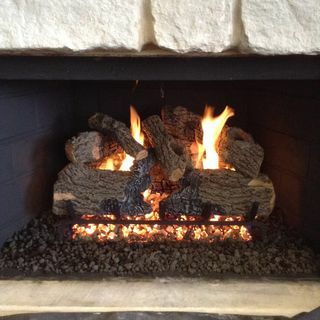 We are the most reviewed chimney company that I'm aware of in the country we're four point eight rated Google readings with the most reviews in Dallas Texas. And as for home adviser were the most reviewed company that they have in the chimney the fireplace industry in the country. It is.